Tons of free assets from yet another old unfinished project. I'm releasing them for free because I think developers will find them useful for prototyping or for game jams. 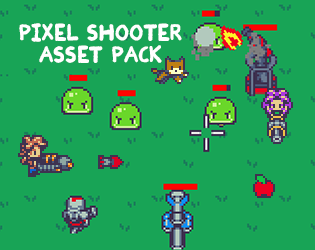 These are pixel art assets for use in a top-down shooter or tower defense type game. Gr8 pack, is there any other 8 directional character packs? I owe you a huge thanks. Sorry I know I've done a bunch of posts about my game here. 😬 My game has changed a lot and now it features nearly all of your asset graphics. Do you want credit? If so, where should I put it? It is now available on itch.io for free! The itch.io version is an open beta for testing new features for iOS. Thank u so much! I'm using it it my games! I've made a topdown shooter based on your graphics. It's still in it's early versions so some animations are not complete and towers and some guns have not yet been implemented. It's for iOS devices and works with both iPhone and iPad. I've used the colour palette to create some more graphics, and I've made a new map and changes a few of the game mechanics from the gif. PS. I'm just starting out at coding and am new at Xcode. I'm only 12 so don't be too harsh. Tell me where I can improve. I'm releasing v.2.0 soon with new guns (hopefully), a new boss and lots of known bugs fixed. I'd like to know where you got the walls in the gif, and if you could possibly make a new asset pack with maps for topdown games like mine. If so, I'd be interested. I thought that it was included as a part of this pack, but maybe not. In any case, it's free for anyone to use without usage restrictions. I have used those sprite to complete a project for my exams in pygame ! now this is the end end of the year and I pass my exams in a few days (I have already writen your name in my documents ! if you want I can send the program by email ! have a good day ! how can I send an attachment ? the folder use about 140 Mo ! Hello I wanted to ask you can use this your art for commercial projects? is it possible to use the graphics and maybe modify it? What kind of license is used on this product. And Congratulations for your skill. I started to use its character for my first android paltformer game. Sooo good. Thank you very much! Can I use into my commercial game? I made a game with same styly of you. I noticed you created a game with this asset and submit to greenlight. When you submit a game to greenlight other people cannot use the same asset. Valve delete games with assets. from other games. Guess someone is using them in that game, but if that's about steam's policies then idk. If they are blocking you it seems like a reasonable anti-theft rule that just unfortunately doesn't account for indie games with freely-released graphics. Maybe someone will be able to sort it out. Don't know much else about it though so good luck. No, they are not blocking. But Valve don't let people use same assets to make games. And it is very strange because it is exactly your gameplay. is this a game ? Nope, sharing the graphic assets. The gif's from a prototype that never went anywhere; shows how the graphics could be used.